http://www.james-johnson.net - also selling FLAC and High Quality MP3! Ecotone finds ambient sound sculptors James Johnson and Brian McWilliams (aka Aperus) at the height of their powers as they deliver a deeply textured environmental sound study using field recordings, electronics and organic instruments. In the studio, the duo improvised and recorded whatever happened as they worked with a wide variety of compositional techniques. Johnson set up song structures and loops on the fly while McWilliams colored around the edges with additional chords and samples. By time they parted ways, they had recorded over two hours of material to digital tape. Final curation and mastering was intensive as McWilliams structured songs, added overdubs, and reprocessed some tracks entirely. Reflecting back, both artists feel that "Ecotone" represents a major milestone in both their catalogs and dedicate it as a strong statement of appreciation and concern for the natural world and its current fragile state. This limited edition run of 500 CD"s features pressed CD's (not burned CDR's) with booklets and tray cards printed on 100% recycled post consumer paper. The first 250 copies will ship with a set of photos chosen from each artist's catalog of landscape photography. "... as a naturalist, my favorite places to be are along the ecotone. It's where it's most alive ... usually ... the edge of the forest and the meadow. It's the edge of the ocean and the sand ... where the rack line occurs. It's that interface between peace and chaos. It's that creative edge that I think we find most instructive. It's also the most frightening. Because it's completely uncertain and unpredictable and that's again where I choose to live." I just received this in the mail on Friday. It's been so long since there has been a release from James and I treasure the various Cube CDs I have, so I was really looking forward to this. My feeling is that James has been one of the best at long or short-form, seemingly "organic", gorgeous environments. Not simply droney, but subtle, quiet, and beautiful. My six-year old daughter often falls asleep to his Cubes and not everything fits that bill. His being dormant has seemed a shame. I have also been familiar with and impressed by McWilliams' music so the pairing was promising. The first thing I noticed was the very attractive and tasteful packaging. But beautiful packaging will annoy me in the end if the music doesn't live up to it. Happily, the music is wonderful. This music is varied. At times it is benevolent, lighter, and gorgeous. At other times it has a darkness, a doubt, a discomfort. But be clear, while these tracks clearly can challenge the listener in ways, it is never difficult to listen to. Even in the darker sections it is beautiful, not jarring, and very listenable. While most ambient music is created by single musicians I think this CD is a testament to the benefits of collaboration. It feels more rounded, it feels like someone was there to cover the blind spots of each musician. This is not a retreading of the earlier work of either musician. The sound of the disc as a whole feels like a clear statement of intention to do something new, but it is still familiar. With the tremendous quantity of ambient music available, I find that there is a small percentage that I really, really value. This will certainly be in that category. I can only agree, "Ecotone" is a masterwork, one of the best of 2013!!! "... Both composers gave a lot of attention to detail, while implementing percussive samples, contact microphone recordings, many surprising animals sounds and vocal tones. It’s a slow moving and profound organic offering of sensitive environmental sight and sound paintings venturing into dense, darker but always spacious territory. Its minimalist, melodic nature and introspective impact occasionally remind of ... Robert Rich, Brian Eno or the gamelan works by Loren Nerell. 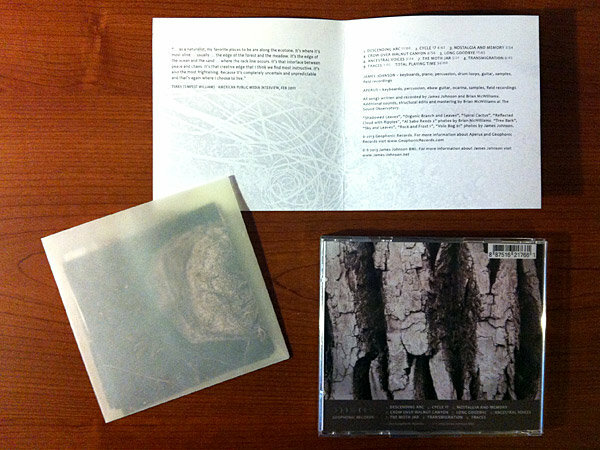 All in all, "Ecotone" (a limited edition release coming with great art work) makes most interesting and intense listen. Highly recommended to all who appreciate deep-listening ambient." "I just received this in the mail on Friday... The first thing I noticed was the very attractive and tasteful packaging. But beautiful packaging will annoy me in the end if the music doesn't live up to it. This is not a retreading of the earlier work of either musician. The sound of the disc as a whole feels like a clear statement of intention to do something new, but it is still familiar. With the tremendous quantity of ambient music available, I find that there is a small percentage that I really, really value. This will certainly be in that category." "Ecotone is a masterwork, one of the best of 2013!!!" Got a great review today. Wanted to share. I think that James Johnson and Brian McWilliams (aka Aperus) are both very talented musicians, each having produced some truly stunning work over the last few years. So it would stand to reason that by working together they would make something even more stunning in collaboration, right? 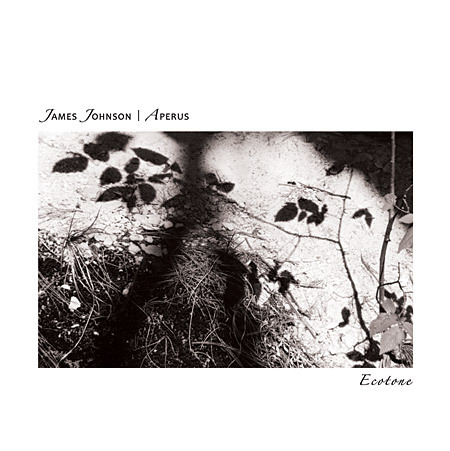 "Ecotone" by James Johnson and Aperus is a beautiful and brilliant release that proves that theory, capturing all the best qualities of each artist and building on their separate gifts to create a truly impressive album. "Descending Arc'' opens the disc with metallic percussion and other percussive sounds, a feeling of mysticism that plays over top a subtly droning pad. As the track progresses other elements are added, slowly building an engaging and involved aural landscape for the listener to explore. "Cycle 17" follows, with oscillating tones running in randomly spaced sine waves. It makes for an interesting aural experience with a number of short patterns and appealing motifs being randomly formed throughout the course of the track. A very interesting example of generative music. "Nostalgia and Memory" is a short track that uses a distorted warble as an anchor for a number of sounds and moods. Add some sparse piano playing a rather forlorn melody and you end up with a particularly emotional piece of music, a decidedly moody track that I quite enjoy. "Long Goodbye" features a number of nicely elongated pads paired with some struck metallic objects that naturally reverberate, a combination that results in some very tasty dramatic moments. I really enjoy the way this track illustrates the musicality inherent in the unexpected, and that sense of discovery that plays throughout really connects with me as a listener. "Ancestral Voices" has a vaguely unsettling feel to it, a disorienting swirl of sounds and voices that rotate around the soundscape alternately building and falling in volume. That's not to say that it's not a good track though, I actually find it to be quite impressive in it's ability to inspire unease. By contrast, "The Moth Jar" has a very delicate beauty to it, lovely piano matched with percussive metallic tones and treated electronics, all working together to create a very beautiful piece of music. Definitely my favorite track on the album. "Transmigration" has a large cinematic quality to it, a big sound that suggests vast open spaces and long panoramic vistas. Certainly an excellent piece of work for use as a soundtrack or perhaps as the inspiration for a short film. "Traces" closes the album, a quick don't-blink-or-you'll-miss-it ambient piece that really embodies the ideal of active listening. There's a lot to discover in this two minute track, a wealth of ideas compressed into a very tiny space. If you choose to listen passively you're sure to notice some of it's charms, but if you actively involve yourself in the track I'm sure you'll be suitably rewarded for your efforts. There's no question that Johnson and McWilliams compliment each other brilliantly on this album, and the end result is an impressive collaboration that's already circling around the top spot on my year end list of groovy music. Take some time to explore "Ecotone", you'll be glad you did.